The Vibrati Punk Console is built around a single printed circuit board (PCB). All the components are placed on one side of the circuit board (the “component side” or top). The component side has labels showing where to place components. The components are soldered in place on the other side of the board (the “track side” or bottom). The track side has the metal tracks or traces that connect the components. I like to build circuits up starting from the shortest components and working towards the tallest ones. This means that when you place components on the board they don’t fall out easily when you turn the board over to solder. 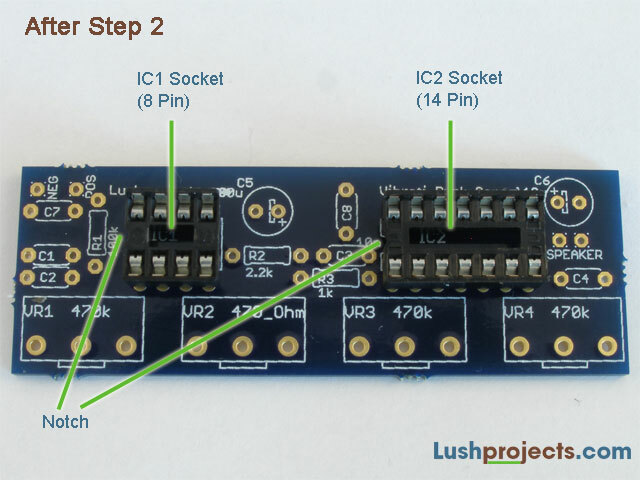 You’ll start building with the sockets that will contain the Integrated Circuits (or “ICs”) in the finished project. You will have two different sockets one with 8 pins and one with 14 pins. The pins are arranged in two parallel rows. At one end of each socket there is a notch in the plastic. This notch shows the correct orientation of the socket. It is vital that you put the socket in the board the right way round and that subsequently the ICs also go in the socket the right way round! We use sockets because the ICs can be damaged by heat; therefore for beginners using sockets is a safer option. Referring to the photos and the markings on the board take one of the sockets and insert it the right way round from the component side of the board. Turn the board over and solder one corner pin and then check that the socket is nice and level in the board. If not melt the solder on the pin and push the socket in nicely. Now solder the diagonally opposite corner and check the socket is still level. With only two corners soldered you should be able to level the socket by working alternately on the two corners. Now solder all the remaining pins. Take care not to bridge adjacent tracks when soldering. If you do bridge tracks then use the “too much solder” advice from the “Soldering is Easy” booklet or try desoldering if you have a desoldering tool.